Flexible working space is one of the key trends for office design, and a company like IKEA – for whom office design is paramount – is helping to set the trend. Flexibility, getting back to nature, and creating an attractive, yet functional, workspace is increasingly important for staff well-being. IKEA, the market leaders in affordable home products, have taken the idea of a biophilic approach seriously and saw a ‘kindred spirit’ in the design of our Hubs. They have been developing stylish, but affordable, home furniture and goods for years They are all about making your space look comfortable and attractive, and they have taken on board the move to ‘homeify’ the workplace. Provide 6 acoustic telephone booths (The Hideout)and 2 acoustic study booths (The Haven)that could fit within an open plan environment. Provide modular units with ease of assembly which could be moved easily. Provide units which fit with the company’s ethos of working for people and the planet. Acoustically effective office pods allow individuals to work away from the distraction of office noise, yet still feel part of the team. 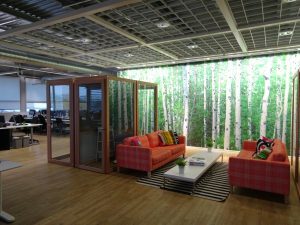 IKEA’s own light fittings and furniture complement the Acoustic Hubs perfectly. A return to nature is key to the thinking behind the Hubs. 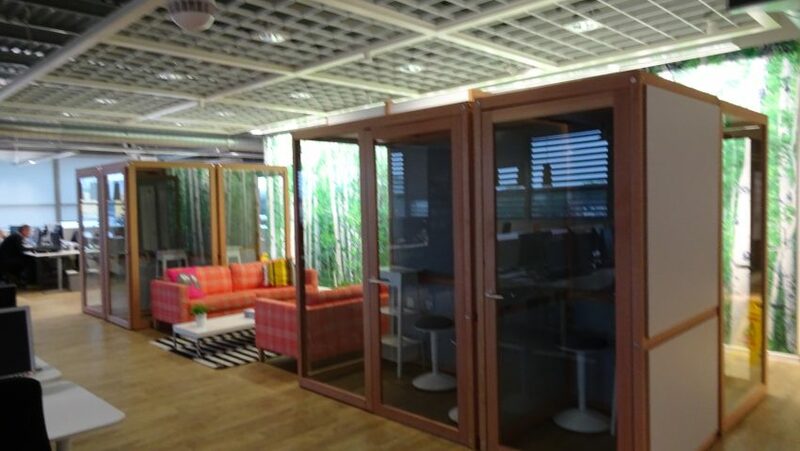 Natural wood and laminated glass echo IKEA’s own biophilic ethos.